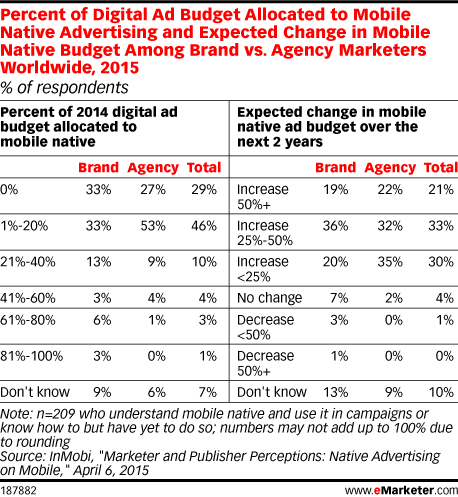 Data is from the April 2015 InMobi report titled "Marketer and Publisher Perceptions: Native Advertising on Mobile." 348 marketers worldwide were surveyed via their mobile devices. Of the respondents, 42% were from agencies, 21% from brands, 4% from DSP/trading desks, 20% from publishers and 13% from other businesses. Respondents were from Africa (4%), Asia-Pacific (40%), Australia/New Zealand (7%), Europe (31%), Latin America (3%), the Middle East (5%) and North America (10%).